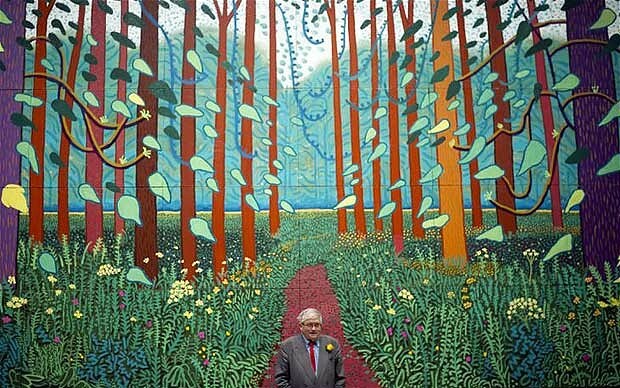 I was blown away by the David Hockney exhibition at the Royal Academy in London today. Perhaps I shouldn't have mentioned it since it closes today! I'm not sure such a vast collection has been brought together before. 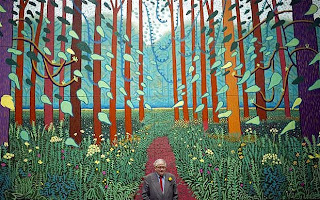 One of Hockney's hopes is that we might learn to look at the natural environment around and see. Having moved back from LA, Hockney revels in the changing light and colour of the seasons. If there's one thing you can say for the UK, it is that we certainly have contrasts-indeed we have seasons-and sometimes all four in one day. When Hockney reflects upon landscapes he notes that it has been said that there is nothing new that a painter could do with such a subject, but on the contrary Hockney's view is that the landscapes around him just need to be looked at and interpreted in different ways. Interestingly this is the thesis of cognitive behavioural therapy, which notes that circumstances may be identical for different people but what matters is how the event or circumstance is seen and hence interpreted. It's the differing interpretations that lead to differing responses, whether of anxiety, or sadness or nonchalance, amongst others.